I talked to someone with Samsung tech support and they had me plug in the device with the charger then hold the power button until it turned off. Then, it stayed off. He told me they are working on an update to fix the issue but this has been working for the other people calling in (and it worked for me). The link to the Guides, FAQs & Tips section is in my signature at the end of this post - but you must view the thread in a browser (not something like Tapatalk) to see the signature links. 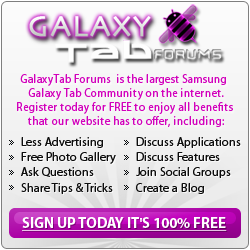 The guide is the first one on that page - [HOW TO] Factory Reset your Samsung Tablet. I'm having the same issue as well and I've read others are experiencing it too. It appears this latest update wasn't tested as throughly as they thought. Did the factory reset and didn't loose any of my emails or anything else I had downloaded but it does cut off and stay off now. I am also having shut down problem with my GT- 2 10.1 p5113. I contacted Samsung via the chat line and was told to request a shipping label and return the device for repairThe problem started immediately following the update to 4.2.2. I tried a factory reset both from the settings screen and using the on/off button and the volume key. The device continued to come back on. I really liked the tablet until the last update. I did use the screen shot, which they took away and I don't care for the new home screen. I would like to go back to the old version, but there is no easy way to do it. When you do a factory reset, you go back to the new 4.2.2 instead of 4.1.1. You can still take a screen shot chuck - just press the power & vol down keys together & you should get a screenshot just as you did before. That method works with all Android devices running 4.x - the additional button is/was a Samsung "feature"... but it wasn't too helpful for "fat fingered folk"
i tried this several times and it did not work! Hi.. Tried the factory reset. didn't work.. Now what? I also tried the factory reset but it did not fix the shut down problem. It still reboots. I also have been experiencing the same problem on my Galaxy Tab 2 10.1 ever since the android update. I have found a workaround that works for me. If I shut the tablet down from the desktop it doesn't shutdown it just reboots. If I go to the Lock Screen and shut it down from there it will shutdown. Like I say, this works for me but it may not work for everyone.